Feeding and eating problems in infants and young children are in most instances, neurologically based. Their far-reaching effects are nutritional, interpersonal, behavioral and developmental, altering the sense of self and self-esteem, family relations, sociability, as well as academic performance. What does picky eating look like? A strapping pre-school youngster demonstrates an extreme reaction to certain foods. Unable to tolerate certain textures in his mouth or smells in his environment, the aroma of certain foods hurts his nose and makes him so upset, he runs out of the kitchen. He spits out most foods, and typically gags, coughs or chokes during meals. Though he is growing normally, his mother fears he isn't getting adequate nutrition from the limited foods he is eating. Their pediatrician has repeatedly told this mother not to worry, as her son's height and weight are in the normal range. An older youngster with a similar problem goes all day at school without anything to eat because he cannot tolerate the smell of food in the cafeteria at lunch time. His food intake during the school day is limited to cakes and chips that he can easily eat on the playground. This same child heaves at the beach in response to the smell of seaweed on the shore. A health practitioner ultimately discovered that this child's brain had difficulty in accurately processing information received from his five senses. A medical doctor who is, and was, a picky eater as a child, recommends that parents of picky eaters "do as my parents wisely did. Give the child a vitamin pill and let her grow out of it. She goes on to say that, "Too much attention could make it worse and lead to an eating disorder." Describing her continued preference today for sugary, fatty and bland foods, she still gravitates towards hotdogs, hamburgers, chicken nuggets, French fries, and ice cream and has only learned to eat vegetables as an adult. Yet, in her opinion, her eating preferences have in no way compromised her daily existence or professional function. This woman is clearly an exception to the rule. Problem feeders describe the one out of twenty children between the ages of birth and 10 who refuse to eat or who will only eat limited numbers of selected foods. Children with feeding disorders (as well as picky eaters to a lesser degree) tend to demonstrate clusters of traits that indicate a broader, more pervasive, neurologically based dysfunction. (Natenshon, 2009 P. 134) Also known as perseverant feeding problems, selective eating, or food neo-phobia, Food Aversion or dysphagia, these feeding problems are characterized by a strong fear of trying new foods, leaving its victims at risk for malnutrition and failure to grow normally. Feeding problems in children often go undetected, and/or are sometimes mistaken for the more benign picky (preference) eating behaviors. Adding to the ambiguity of terms in diagnosing these problems, by the time problem feeders reach adulthood, the diagnostic terminology describing feeding problems is adult “picky eating." (see PickyEatingAdults.com). Problem feeders tend to demonstrate diverse clusters of traits, covering a spectrum of broader, more pervasive, neurologically-based dysfunctions which compromise the person's existence; these might include sensory integration disorder (SID), Asperger's syndrome, Non-Verbal Learning Disability (NVLD), and/or Pervasive Developmental Disorder (PDD) and can include such symptoms as choking, gagging, vomiting, difficulty swallowing, etc. Individuals suffering from varying degrees of these disturbances in early life carry varying degrees of pathology with them into their adult years. Physiological conditions that can create or exacerbate feeding problems include cystic fibrosis, cerebral palsy, autism, low muscle tone and allergies, as well as sensory, oral-motor, gastro, cardiac, metabolic and genetic disorders. Another condition known as "burning mouth syndrome" the result of a dental procedure, may affect a person's relationship with food, as does Arnold-Chiari Malformation, (ACM), where the brainstem, pressing on the top of the spine, compresses the nerve that regulates breathing, gagging, etc. 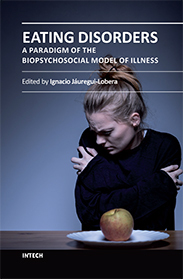 Harnessed with restrictions, compulsions, fears and limitations regarding food consumption, children and adults alike feel like societal outcasts, alone, isolated and seriously misunderstood, not only by loved ones, but by the vast majority of health professionals who minimize their problem and their suffering. Picky eaters are generally perceived by others as being stubborn, inflexible, obstinate and unadventurous. Picky eaters deny themselves more than nourishment, and self-care, as symptoms require that they restrict opportunities for sociability, recreation and celebration. Rigidity and the inability to adjust to new foods generalize to anxiety and fear in the face of newness and change in all life spheres. Distinguishing problem feeders from picky eaters is not intended to negate the seriousness and consequences of the picky eating syndrome, emotionally, nutritionally and interpersonally. Though the picky eater typically becomes conditioned to using food as a device to attract attention and/or exert undue control in family situations, parents must not lose sight of the primary issues giving rise to these problems and must learn to deal simultaneously with their causes as well as their effects. Dr. Kay Toomey, one of the nation's leading specialists in treating problem feeders, is cofounder of Children's Hospital Oral Feeding Clinic in Denver and is director of Colorado Pediatric Therapy and Feeding Specialists, Inc is best known for developing the multidiscipline Sequential, Oral, Sensory (SOS) Approach to Feeding. Toomey refutes the idea that eating is completely instinctual. She says that "instincts only start the process, and only then if they are not interfered with by premature birth or a physical disorder. Eating is, in reality, a learned behavior. Just as children learn to eat, so children can be taught to not eat by the circumstances of their lives. If the smell of oatmeal hurts a child's nose, he believes that it will certainly hurt his mouth." Toomey goes on to say that "In the SOS approach, the first step is figuring out how a child learned not to eat, be the triggers genetic and chemical or environmental. If children have a sensory integration disorder, it becomes difficult for them to understand and put together all the different pieces (requirements and functions) involved with the process of eating." The earlier the child is given a diagnosis and offered an opportunity to make remedial changes, the timelier and more effective and sustainable are the outcomes for change on the individual and within the neuro-plastic brain. It is for the parents of picky eaters to educate themselves first, so that they can educate, coach, and mentor their children. Picky eating disorders must be distinguished, too, from early childhood eating disorders (anorexia, bulimia and compulsive overeating/binge eating disorder). Unlike eating disorders, picky behaviors are not associated with distorted body image, fear of eating fat or becoming fat, or mood, control or identity issues that characterize clinical eating disorders. For picky eaters, the fear is of the painful sensation of putting aversive textures, tastes and smells in their mouth. Despite this, some picky eaters are treated inappropriately on hospital units devoted to the care of clinical eating disorders. A similarity between picky eating syndrome, feeding disorders and clinical eating disorders lies in these conditions being biologically and genetically based. Though feeding problems may have origins in "nature," treatment and healing of these syndromes lies squarely within the bounds of "nurture," assuming there is sufficient motivation and incentive to stimulate change. "Is there anything really wrong with sticking to a few foods that the child likes and that nourish him?" A commonly asked question, many parents and adult patients wonder about the legitimacy of extreme personal preferences in choosing foods, particularly when the child's weight remains in the realm of normal. This parent goes on to ask, "Does it have to be a food allergy or philosophical beliefs about eating (i.e. vegetarianism) for it to be okay to consume a limited menu?" A food “preference” is just that. What a preference is not is an eating lifestyle, a fear or aversion to foods that is severe enough to compromise a healthy diet and the ability to nourish oneself healthfully. Though "pathologizing" a benign condition is not helpful, at the same time, it is unwise to ignore a problem simply because you can. Research shows that many of the children who later develop clinical eating disorders were picky eaters from the start of life. Picky eating problems are integrative in nature and need to be integrative in their healing. Problem eaters tend to be genetically and neurologically wired to eat in the way that they do. In addition, the natural progression of behaviors associated with these problems wreaks havoc with a body and brain, bringing on metabolic process dysfunction through an unhealthy relationship with food and eating and emotional problems. Problem eating is a red flag, an indicator that something is amiss. A problem must be recognized and defined as such before it can be resolved. With feeding disorders, the earlier the problem is defined and addressed, the more timely and effective will be the solution. "Should I start making an issue out of my child's eating patterns? Should I try to get him to try new foods? Will doing this make it more of a problem than it seems to him right now?" It is an interesting concept that a problem is not a problem unless it is identified as such, defined, literally, through words and the expression of real feelings. By not speaking one's thoughts and observations, by not verbalizing what everyone knows and believes, parents and care takers enter an implicit contract of dishonesty in "turning the other cheek," pretending not to look at… and not to see… the "elephant under the chair." If you knew something was good for your child, such as learning to look both ways before crossing the street, or taking antibiotics for an ear infection or strep throat, would you be asking the same question about whether of not to step up to the plate and assume your responsibility as a parent to educate your child about how to become more capable of fueling his brain and body for a healthfully functioning life? It is interesting to note that a child's eating routines and habits are determined by the age of two; at the same time, it can take as many as 10 times offering a child a new food before the child will feel comfortable eating it. By not making these efforts, the parent may inadvertently be teaching the child an important life lesson about not taking risks in trying new things in enhancing his existence. People who cannot take risks and adapt to new situations with food and eating, may find themselves unable to face and handle all forms of life risks and transitions. 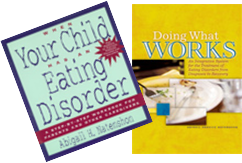 Doing What Works: An Integrative System for the Treatment of Eating Disorders from Diagnosis to Recovery, Abigail H. Natenshon NASW Press, 2009 Washington, D.C.